The TSD Twin Blade Collar lets a user add a bit of flash to any jig, spinnerbait, buzzbait or chatterbait in seconds. Slip the collar system over the shank of the hook and slide up to the keeper barb. 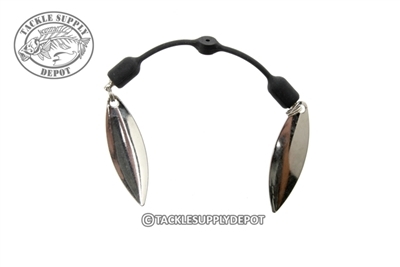 The dual small willow leaf blades will freely move on the bait and draw attention. If using a skirt making tool these can also be used in place of standard skirt collars. Also effective when paired with an EWG hook on the belly of a swimbait or buzz toad.